"Zephyr Blue Persian Set with Tangerine Lip Wraps created by Dale Chihu"
An image of the sculpture Zephyr Blue Persian Set with Tangerine Lip Wraps on the campus of the University of Northern Iowa in Cedar Falls, Iowa. The sculpture was installed in 1999 and is an Iowa Art in State Buildings Project purchase. The medium is glass. 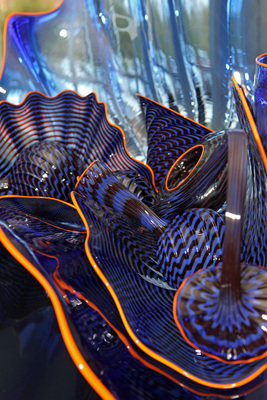 "Zephyr Blue Persian Set with Tangerine Lip Wraps created by Dale Chihuly" (2019). Art on Campus Photographs. 3.